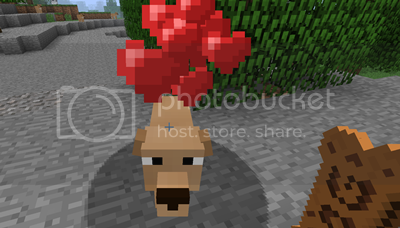 Copious Dogs Mod for Minecraft 1.7.4 is created by three main developers. This mod updates the doggy life within Minecraft. It adds several new breeds of dogs, and not to mention new ways to train and care for your little puppy friend. If you’re a player who has always wanted to own your own Beagle or Husky – then you can now do that! The mod is currently available for the latest patch of Minecraft 1.7.4 and can also be installed for servers and client single player. To use the Copious Dogs mod, you first of all need to find a wild dog. Next, simply give the dog a newly added biscuit, and also a collar and a leash. Doing this will make it follow you and then you can continue to access further parts of the mod. You can now find a wild dog, give it a leash, biscuit and collar and successfully own it. Every time your dog gets hurt you have to feed him. You have to do this by filling a bowl with pork. You can rename your dogs, and also breed them too. The new dog breeds include ‘Golden Retriever, Husky, Beagle, Dalmatian’ and more! Next, download the Copious Dogs Mod and drag and drop it into the .minecraft/mods folder of your Minecraft directory. There are currently no public changelogs for this mod.